Published: December 2010. Last Updated: May 2011. 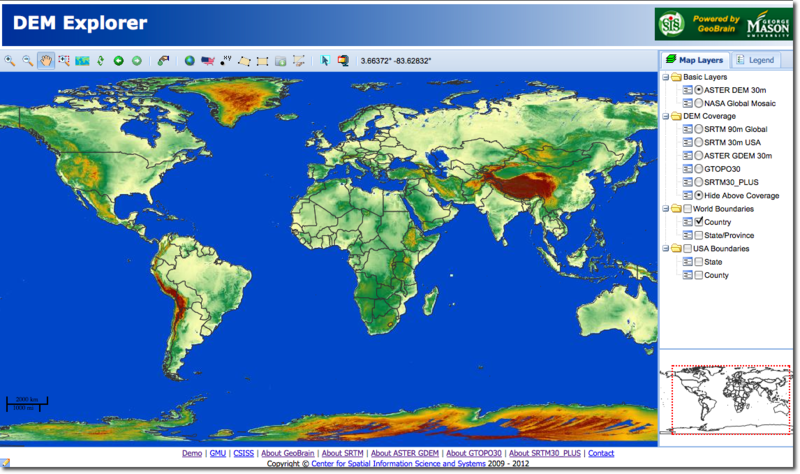 Screen capture of GeoBrain DEM explorer interface. In this chapter, you will use Geobrain Online Analysis System (GeOnAS) to access, view, and process digital elevation model (DEM) data. This DEM data will then be imported into My World GISTM in order to visualize the potential sea-level rise that could occur during a tsunami run-up event near Seaside, Oregon. In My World GIS, the DEM contours will be overlaid with additional geographic data, such as roads and schools, allowing you to see the potential impact of a tsunami event on transportation, infrastructure, housing, and natural habitat in this region. In the aftermath of the devastating 2004 tsunami that hit the Indian Ocean, coastal countries have been concerned about the potential threat of tsunami destruction. Citizens and governments feel compelled to be informed about the potential impact of a tsunami run-up in their own region. Your task in this chapter is to identify the potential consequences of a five, fifteen, and twenty-meter sea level rise due to a tsunami run-up on the Oregon coast near the town of Seaside. Once you have evaluated the region of potential inundation with My World GIS, you will plan evacuation routes for two schools in the town of Seaside.